THIS IS A FABULOUS OLD VINTAGE WALL MOUNTED HANGER THAT CAN BE A TOWEL HOLDER, COAT HANGER OR HAT HOLDER. This was made using a fabulous piece of salvaged wood that has the original aqua green paint that is crackly, chippy, peely for a perfect patina. 5 old salvaged old glass cabinet knobs were added to the wood. There is a hanger on the back. Perfect to add a touch of architectural interest to your room, or to use for hats, jackets, towels, dried flowers or more! Perfect in your home in your shabby chic, French country, Paris Apt or romantic cottage decor. Measurements are about 32" long by 4 1/2" tall. THIS IS JUST EXQUISITE AND OVER THE TOP INCREDIBLE! THIS IS AN OLD FRENCH HEADER WITH SWAGS OR GARLANDS OF ROSES AND FLOWERS AND OTHER DETAILS. This is an older header that is a little over four feet long. This is wood in a nice shape with the original detailing. There are swags or garlands of roses and flowers all across, and a little basket filled with flowers. It has the old white paint with the gold on the detailing. There is chippy paint, paint loss, crackly paint, minor dirt, and wear for the fabulous patina. There are a few holes where it was used to hang on the wall. A hanger was added to the back. Measurements are about 53" long by 18" tall by 1 3/4" thick. It weighs about 12 pounds. THIS IS A GORGEOUS VINTAGE PORTRAIT OIL PAINTING OF A BEAUTIFUL WOMAN THAT IS PAINTED ON A CANVAS PANEL.. This is well painted . It has a nice mid century look to it.. It is painted on canvas panel. There is a little paint loss and wear. It is signed, but I can't make it out. This would be stunning in any shabby chic, mid century, romantic cottage or French Country home. Measurements are about 9" by 12 ". THIS IS A PAIR OF FABULOUS OLD VINTAGE DECOR PIECES WITH BIRDS, BRANCHES AND APPLES WITH A GREAT LOOK. This is two pieces that you can hang together to create the look of one long header or separate. These are each about 21" long. They are all metal with a very nice curvy shape. Each one has a charming bird, three apples and leaves. They each have a candle holder cup, if you wanted to add candles. They have the original paint, that is now chippy, with paint loss, a little rusty, with wear for a great patina. Perfect in your home in your shabby chic, French country, Paris Apt or romantic cottage decor. Measurements are about 21 " long by 11" tall on the ends with the birds. They weigh a total of 2 pounds. PLEASE ADD ME TO YOUR FAVORITES AND CHECK BACK OFTEN! PLEASE SCROLL ALL THE WAY DOWN TO SEE ALL THE PHOTOS. THIS IS A FABULOUS OLD VINTAGE WALL MOUNTED HANGER THAT CAN BE A TOWEL HOLDER, COAT HANGER OR HAT HOLDER. This was made using a fabulous salvaged architectural header that is wood that has the original light green paint that is crackly, chippy, peely for a perfect patina. There are old metal hardware at the ends and nail holes for a great look. 4 old salvaged old glass door knobs were added to the wood. There is a hanger on the back. Perfect to add a touch of architectural interest to your room, or to use for hats, jackets, towels, dried flowers or more! Perfect in your home in your shabby chic, French country, Paris Apt or romantic cottage decor. Measurements are about 42" long by 7" tall. THIS IS A GORGEOUS OLD VINTAGE WALL TRUMEAU MIRROR WITH GARLANDS OF ROSES AND FLOWERS OVER THE TOP CHERUB WITH BIRDS AND ROSES PRINT. This is a wood frame with the mirror on the bottom and the print on the top. It has a beautiful garland of roses and flowers detailing that is metal or tin and goes over the print. The print is so pretty with a sleeping winged cherub with birds and pink roses. There are some creases and wear to the print, which is covered with glass. The mirror has the original gold paint that is chippy, with paint loss and wear. There is a little bit of missing or chipped gesso at the bottom, as I show. The beveled mirror itself is original that is ghosty, streaky, with silver loss and spots for a desirable look. There is a hanger on the back. This would be stunning in any shabby chic, romantic cottage, Farm House, Jeanne d'Arc Living, or French Country home. Measurements are about 30" tall by 15 1/2" wide. It weighs about 7 1/2 pounds. THIS IS A FABULOUS OLD VINTAGE ITALIAN TOLE WALL SCONCE CANDLE HOLDER WITH A LARGE CHERUB. PLEASE NOTE THAT THIS IS NOT ELECTRIFIED, AND IS JUST A SCONCE OR CANDLE HOLDER. This is an older wall sconce that is metal or tole. A precious cherub with wings is holding up three candle holders. It has the original gold paint that is a little chippy, with some rust, and time worn for a great patina. PLEASE NOTE, there are a couple areas where the rust has created some missing metal or holes, as I show, that is mostly on the back stem. . You could add candles in the holders , or just hang like this to add a touch of French elegance to your home. Perfect for your shabby chic, romantic cottage, Farm House, Jeanne d'Arc Living, or French Chic home. Measurements are about 20" by 19" by 7" deep. It weighs about 2 pounds. OMG! THIS IS INCREDIBLE. IT IS AN OLD ANTIQUE PICTURE ON A LARGE CANVAS. IT IS OF A GORGEOUS WOMAN WITH TWO WINGED CHERUBS. This is one of those amazing statement making prints that is older and of good quality. It is a print or silk screen on a textured canvas. It is flat, so it can be rolled for reasonable shipping. I love hanging pictures on my walls like this and already have several in my own home. The woman is beautiful and is sitting down. She is surrounded by two precious cherubs. The colors are breathtaking.. There are some minor scratches and wear, as I show. There is some slight unraveling along the edges, as I show. You can see the old nail holes with some rust from the nails along the edges. There is a little discoloration and fading along the edges. What a statement this will make in your home! Measurements are about 43 1/2" tall by 28" wide. HIS IS A DROP DEAD GORGEOUS OLD ANTIQUE OIL PAINTING OF PINK ROSES AND FRAMED IN THE ORIGINAL FRAME. This came out of my personal collection of rose oil paintings. I absolutely love it, but just don't have a spot for it anymore.This is an older painting that is painted on canvas that is nailed to a wood stretcher frame. This is such a classic Sunday afternoon painting from the early 1900's. The colors are breathtaking. There is paint loss, scratches, and wear, as I show. It is framed in the original wood frame that has some chippy paint and a little missing gesso.. This would be stunning in any shabby chic, romantic cottage, Farm House or French Country home. Measurements are about 28 1/2" by 17". THIS IS AN EXQUISITE PAIR OF OLD VINTAGE ITALIAN TOLE WALL SCONCES CANDLE HOLDERS WITH WHITE BIRDS AND PINK ROSES THAT ARE 22" TALL EACH. PLEASE NOTE THAT THESE ARE NOT ELECTRIFIED, AND ARE JUST SCONCES OR CANDLE HOLDERS. What a drop dead gorgeous pair. These are older Italian tole pieces of very good quality. They are a nice statement making size. Each one has two precious white birds and lots of pink roses and green leaves.. The colors are gorgeous, with a little chippy paint, and time worn for a perfect patina. They have the older Made in Italy tag on one, as I show. Perfect for your shabby chic, romantic cottage, Farm House, Jeanne d'Arc Living, or French Chic home. Measurements are about 22" tall by 11" wide and 5" deep each. They weigh about 7 pounds total. THIS IS AN EXQUISITE OLD VINTAGE FRENCH PICTURE FRAME THAT HAS ORNATE BARBOLA DETAILING ALL AROUND. This is an older picture frame of good quality. The frame is wood with 4 layers of ornate barbola detailing all around. It has the original gold paint that is chippy, with color variation, with paint loss, and wear. There are some minor old surface hairline cracks, as I show, but it is solid. There are also some pieces of missing barbola detailing, as I show There is no glass. It can be hung vertically or horizontally. Perfect in your shabby chic, French country or romantic cottage decor. Measurements are about 27" by 30"" wide for the outside. The inside is 20" by 16". THIS IS A BEAUTIFUL OLD VINTAGE OVAL PICTURE FRAME THAT HAS ORNATE BARBOLA DETAILING ALL AROUND. This is an older picture frame of good quality. The oval frame is wood with ornate barbola detailing all around. It has the original gold paint that is chippy, with color variation, with paint loss, and wear. There are some minor old surface hairline cracks, as I show, but it is solid. There is no glass. It can be hung vertically or horizontally. Perfect in your shabby chic, French country or romantic cottage decor. THIS IS AN EXQUISITE PAIR OF OLD VINTAGE WALL SCONCES CANDLE HOLDERS WITH BEADED BOBECHES AND DRIPPING CRYSTALS. PLEASE NOTE THAT THESE ARE NOT ELECTRIFIED, AND ARE JUST SCONCES OR CANDLE HOLDERS. These are so unique and gorgeous! They have metal frames with each having three metal holders or bobeches. These candle holders have beautiful beaded crystals or beads on the sides and bottoms.. They are dripping with the old original crystals in different sizes and shapes. I didn't notice any missing crystals. You could add candles in them, or just hang like this to add a touch of French elegance to your home. Perfect for your shabby chic, romantic cottage, Farm House, Jeanne d'Arc Living, or French Chic home. Measurements are about 17" tall by 14" wide and 8" deep each. They weigh about 7 pounds total. HESE ARE FABULOUS! THIS IS A PAIR OF OLD VINTAGE CAST IRON METAL HANGING WALL PLAQUES WITH CHERUBS, ROSES AND ORNATE DETAILS. This is the second pair of these that I have. These have such a great French look. They are a little heavy for their size, and are cast iron metal. They are a nice shapely oval with cherubs or angels with wings at the top. There are roses in the design. They have the old brownish gold finish that has discoloration, with color variation, some old turquoise, scratches and time worn for a perfect patina. The patina's are not exactly the same, as I show. This would be fabulous in any shabby chic, romantic cottage, Farm House or French Country home. Measurements are about 9 1/2" tall by about 5 1/2" wide and weigh a total of about 4 pounds. THIS IS FABULOUS. THIS WOULD LOOK AMAZING HANGING ON A WALL IN YOUR HOME. IT IS AN OLD KEY HOLDER OR BOARD WITH 150 HANGING KEYS. Wow! What a great old keyholder board , and a fabulous decorative home d�cor item! This is wood that has the old white paint on the front and a nice size. There are old pencil lines and writing, along with old tape with names on them. There are 150 nails that are nailed in slanted to the wood. The nails are mostly rusty now. On each nail in an old key blank. There are scratches, stains , dirt, marks and minor wear for a great look. The keys are included. There is a hanger at the back. What a statement this will make! Perfect in any shabby chic, romantic cottage, farmhouse or French country home. Great in any shabby chic, Victorian, Antique, romantic cottage, Farm House or French country home. Measurements are about 22" by 27". THIS IS A FABULOUS OLD VINTAGE WALL MOUNTED HANGER THAT CAN BE A TOWEL HOLDER, COAT HANGER OR HAT HOLDER. This was made using a fabulous piece of salvaged wood that has the original white paint that is crackly, chippy, peely for a perfect patina. An awesome old metal double hook was added to the wood. There is a hanger on the back. Perfect in your home in your shabby chic, French country, Paris Apt or romantic cottage decor. Measurements are about 11 1/2" tall by 8" wide. It extends out about 4" and weighs about 3 pounds. THIS IS JUST GORGEOUS! IT IS AN OLD FRENCH WOOD DRAWER FRONT WITH A THICK ROSE GARLAND OR SWAGS OF ROSES AND FLOWERS. This is an older piece that is a salvaged drawer front from an old chest of drawers. It has a wood back with wicker over it. On it is the original thick garlands, swags and bow with roses and flowers. It has the original glass door knobs at the end. The pattern has a very French Chic look to it that is very ornate. It has the old white paint that is chippy, with paint loss, discoloration and wear for an awesome patina. My husband added a hanger to the back. This would make a great hanger for keys of some hanging dried flowers or just as a wall hanging.. Perfect anywhere in your home in your shabby chic, French country, Paris Apt or romantic cottage decor. Measurements are about 24" long by about 5 1/2" tall. It weighs about 1 1/2 pounds. THIS IS FABULOUS. THE OLD SIGNS ARE SO POPULAR AND LOOK AMAZING HANGING ON A WALL IN YOUR HOME. THIS IS AN OLD METAL ADVERTISING SIGN THAT WAS FROM AN OLD FLORIST SHOP THAT SAYS, CLOSED SUNDAYS & MONDAYS DURING JANUARY & FEBRUARY. Wow! What a great old vintage sign , and a fabulous decorative home decor statement making item! It is all metal and a nice size . It is a white background with black lettering. There is chippy paint, paint loss, some stains, scrapes, scratches, and minor dings. There are two holes that were used to hang it. What a statement this will make! Perfect in any shabby chic, romantic cottage, farmhouse or French country home. Great in any shabby chic, Victorian, Antique, romantic cottage, Farm House or French country home. Measurements are about 27 1/2" wide by 24" tall. HIS IS JUST GORGEOUS! IT IS AN OLD VINTAGE OIL PAINTING IN BEAUTIFUL COLORS OF PANSIES. This is painted on a canvas that is nailed to a wood stretcher frame and is well painted. It is an older painting of good quality. The pansies look so well. The colors are beautiful. There is some minor paint loss, scratches, minor dirt and wear. There are repairs to the back with tape, as I show. This would be stunning alone or on a wall of old floral paintings in any shabby chic, romantic cottage or French Country home. Measurements are about 26" by 8". THIS IS A GORGEOUS OLD VINTAGE WALL FRAME WITH AN AMAZING ORNATE GESSO DETAILING AND WITH THE ORIGINAL PAINT. This is a nice larger size. It is all wood with the gorgeous gesso detailing all around the frame with flowers in the design. It has the creamy white paint with touches of muted gold that is chippy, crackly, with paint loss and time worn for a great patina. There is a little bit of missing gesso, as I show, and some old hairline surface cracks. It can be displayed horizontally or vertically. Perfect anywhere in your home in your shabby chic, Farm House, French country, Paris Apt, Jeannie d Arc Living, or romantic cottage decor. Measurements are about 20 1/2" by 25 1/2" for the outside. The inside is about 15" by 20". It weighs about 3 1/2 pounds. THIS IS A GORGEOUS OLD VINTAGE FLORAL OIL PAINTING OF A VASE OF PINK FLOWERS AND FRAMED IN THE ORIGINAL FRAME . This is an older oil painting that is painted on canvas that is nailed to a stretcher frame. The flowers are so pretty in pink. It is signed what looks like T. Fendler and dated 48. There is some paint loss, minor dirt and wear. It is framed in the original wood frame with chippy paint and wear also. This would be stunning alone or on a wall of old flower paintings or on a shelf in any shabby chic, romantic cottage, Farm House or French Country home. Measurements are about 14" by 14". This is an older picture frame. The frame is wood with ornate detailing all around. It has the original creamy white on three sides and aqua on one side paint that is chippy, with color variation, with paint loss, and wear. There are some minor old surface hairline cracks. There is no glass. It can be hung vertically or horizontally. Perfect in your shabby chic, French country or romantic cottage decor. Measurements are about 12" by 10"" wide for the outside. The inside is 10" by 8". THIS IS ONE OF THE MOST GORGEOUS OLD ANTIQUE FLORAL OIL PAINTING OF CHRYSANTHUMUMS OR MUMS ON CANVAS. This is an older painting that is painted on academy board that is well painted. This is from the early 1900's. The colors are breathtaking. I love the gorgeous pink ribbon bow holding the bouquet of beautiful flowers. The flowers are painted vertically. There is minor paint loss, scratches, and wear, as I show. This would be stunning in any shabby chic, romantic cottage, Farm House or French Country home. Measurements are about 24 1/2" tall by 17" wide. HIS IS JUST EXQUISITE . IT IS AN OLD VINTAGE OIL PAINTING IN BEAUTIFUL COLORS OF PANSIES. This is painted on a canvas that is nailed to a wood stretcher frame and is very well painted. It is an older painting of good quality. The pansies look so well. Around the painting on the canvas is a lightly textured border in white that gives it the effect of being framed. The colors are beautiful. There is some minor paint loss, scratches, minor dirt and wear. This would be stunning alone or on a wall of old floral paintings in any shabby chic, romantic cottage or French Country home. Measurements are about 22" by 14". THIS IS A GORGEOUS OLD VINTAGE WALL TRUMEAU MIRROR WITH AN OIL PAINTING OF ROSES ON TOP AND PRETTY BARBOLA GESSO DETAILING. This is a wood frame with the mirror on the bottom and the rose oil painting on top. It has beautiful barbola gesso detailing on the wood frame and an arched top . The top of the mirror has a oil painting with roses and flowers. The frame has the original paint that is chippy and time worn. There are a few old hairline surface cracks to the gesso, as I show, but it is very solid. There is a little bit of wall paint on the side of the mirror, as I show. The mirror itself is original that is ghosty, streaky, with silver loss and spots for a desirable look. There is a hanger on the back. This would be stunning in any shabby chic, romantic cottage, Farm House, Jeanne d'Arc Living, or French Country home. Measurements are about 30 1/2" tall by 14 1/2" wide. It weighs about 6pounds. THIS IS A GORGEOUS OLD VINTAGE PORTRAIT OIL PAINTING OF A BEAUTIFUL WOMAN WITH SHORT HAIR AND WEARING A BLOUSE WITH A LACE COLLAR. This is very well painted . The colors are just gorgeous to fit in any d�cor. It is painted on canvas that is nailed to a wood stretcher frame. It is a great portrait pose. with the woman sitting in a chair and looking off to the side. It is in great condition with minor paint loss ,and minor wear. There are no dates . The back says Midge Jameson. It is also signed on the front M. Jameson. This would be stunning in any shabby chic, mid century, romantic cottage or French Country home. Measurements are about 20" by 24" . BE SURE TO ADD SHABBYTOWNUSA TO YOUR FAVORITES AND CHECK BACK OFTEN. PLEASE SCROLL ALL THE WAY DOWN TO SEE ALL THE PHOTOS. 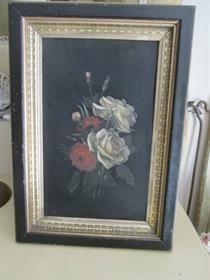 THIS IS A BEAUTIFUL OLD ANTIQUE PAINTING OF BLUSH WHITE AND PINK ROSES THAT IS PAINTED ON METAL. This is so pretty! It has a nice blue painted background. The roses are painted vertically on the metal tin piece. There is paint loss, scratches, and wear, as I show. The corners of the metal are bent a little as I show. There is a hanger on the back. This would be stunning in any shabby chic, romantic cottage, Farm House or French Country home. Measurements are about 20" by 14". THIS IS A GORGEOUS OLD VINTAGE WALL FRAME WITH A BARBOLA GESSO DETAILS ALL AROUND . This is such a nice size wall frame. It is older and of good quality. The frame is wood with gesso. It is very ornate with gorgeous detailing all aroundwith stunning details. The frame has a gorgeous creamy tan paint that is chippy, with color variation, with paint loss, scratches and wear. There is a little missing gesso, but it is solid. It can be displayed vertically or horizontally. Perfect in your shabby chic, French country, Farm House or romantic cottage decor. Measurements are about 25 1/2" by 21 1/2". The opening is about 16" by 20" .It weighs about 4 pounds. THESE ARE TWO ADORABLE VINTAGE PRINTS OF PRETTY BABY OR BABIES, FRAMED AND BEHIND GLASS. This is a pair of vintage prints that are signed Bessie Pease Gutmann and titled "A LITTLE BIT OF HEAVEN" AND "AWAKENING" Each has a precious baby and each has a beautiful face and lying down. They are framed in nice wood frames with delicate detailing. There is minor wear. They are covered with glass. The backs have a paper covering and a hanger. Measurements are about 13" by 18" each. They weigh a total of 5 pounds. EXQUISITE Old Antique ROSE OIL PAINTING Pink ROSES on Board OMG! THIS IS A BEAUTIFUL OLD ANTIQUE OIL PAINTING OF PINK ROSES . This is an older painting that is painted on academy board. This is such a classic Sunday afternoon painting from the late 1800's or early 1900's. The colors are breathtaking. The roses are well painted and beautiful. There is paint loss, scratches, and wear, as I show. You can see along the edges where it was removed from the frame. There is a little bit of missing board in the lower right corner, as I show. This would be stunning in any shabby chic, romantic cottage, Farm House or French Country home. Measurements are about 12" by 17". THIS IS A FABULOUS OLD VINTAGE HEADER WITH NICE SCALLOPS AND WITH THE ORIGINAL CHIPPY WHITE PAINT. This is all wood. I think it was part of an old window valance. It has nice deep scallops along the bottom. It is about 26" long. It has the old white paint that is chippy, crackly, peely and time worn for a great patina. This would add a nice architectural touch to any room of your home. A hanger was added to the back. Perfect anywhere in your home in your shabby chic, French country, Farm House, Paris Apt or romantic cottage decor. Measurements are about 26 1/4" long by about 8" tall. The wood itself is about 1/4" thick. there is an extra piece of wood at the top making it about 1 1/2" thick. THIS IS A GORGEOUS OLD VINTAGE WALL TRUMEAU MIRROR WITH AN ETCHED MIRROR ON TOP AND PRETTY BARBOLA GESSO DETAILING. This is a wood frame with the mirror on the bottom and the top. It has a beautiful barbola gesso detailing with roses, flowers on the arched top and bottom corners. There are some old hairline surface cracks to the gesso. The top of the mirror has a thick etched design that you can actually feel and the thick etching line that separates the top and bottom. It has the original creamy white or ivory colored paint that is chippy and time worn. The mirror itself is original that is ghosty, streaky, with silver loss and spots for a desirable look. There is a hanger on the back. This would be stunning in any shabby chic, romantic cottage, Farm House, Jeanne d'Arc Living, or French Country home. Measurements are about 36" tall by 12" wide. It weighs about 10 pounds. HIS IS SO SWEET! IT IS A LITTLE WOOD WALL SHELF WITH A MIRROR AND HAND PAINTED FLOWERS AND A BUTTERFLY. This is an older wood shelf with a shapely shape. It is a small shelf that has a little beveled mirror. The little shelf folds UP. On the sides and bottom are gorgeous white daisies and petite blue flowers. At the top is a sweet little butterfly. There is a little paint loss chippy paint and time worn. There is a little piece of chipped wood at the lower right corner. There is a hanger at the top. Measurements are about 9 1/4" tall by 6" wide. The little shelf is only 5 1/2" by 2 1/4" deep. THIS IS A GORGEOUS OLD VINTAGE WALL TRUMEAU MIRROR WITH AN ETCHED MIRROR AT THE TOP AND PRETTY BARBOLA GESSO DETAILING. This is a wood frame with the mirrors on the bottom and the at the top. It has a nice arched top with a gorgeous detail at the top. The top mirror has a stunning etched design. There is silver loss, streaking and ghosting to the mirrors. It has the old paint with chippy paint, scratches, minor stains, and wear. There is a little bit of missing gesso at the bottom, as I show. There are some old hairline surface cracks, but it is solid. There is a hanger on the back. Sorry for the reflections! This would be stunning in any shabby chic, romantic cottage, Farm House, Jeanne d'Arc Living, or French Country home. Measurements are about 33" tall by 13 3/4" wide. It weighs about 9 pounds. THIS IS A BEAUTIFUL OLD ANTIQUE ROSE OIL PAINTING OF GORGEOUS PINK AND RED ROSES THAT IS PAINTED ON CANVAS. This is an older oil painting of good quality that is painted on canvas that is nailed to a stretched frame that is well painted. This is a Sunday Afternoon rose painting of the Victorian Era There are some paint loss, chippy paint, scratches and minor wear. No dates or signatures. This would be stunning alone or on a wall of old rose paintings in any shabby chic, romantic cottage, Farm House or French Country home. THIS IS A GORGEOUS OLD ANTIQUE FLORAL OIL PAINTING OF GORGEOUS PANSIES THAT IS PAINTED ON CANVAS. This is an older oil painting that is painted on canvas that is nailed to a wood stretcher frame. It has beautiful pansies that look so real. It is well painted and the colors are stunning. There are scratches, paint loss, chippy paint and wear. No signatures or dates. This would be stunning alone or on a wall of old floral paintings in any shabby chic, romantic cottage, Farm House or French Country home. Measurements are about 24" by 18". THIS IS A BEAUTIFUL OLD ANTIQUE ROSE OIL PAINTING OF GORGEOUS WHITE AND RED ROSES THAT IS PAINTED ON TIN OR METAL, AND FRAMED IN THE ORIGINAL FRAME This is an older oil painting that is well painted. This is a Sunday Afternoon rose painting of the Victorian Era There are minor scratches, paint loss and minor wear. No dates or signatures. It has the old square nails, so this is probably pre 1900's. It is framed in the original wood frame with a nice gold gesso border along the inside. that has paint loss and wear. There are minor hairline surface cracks, but it is solid. This would be stunning alone or on a wall of old rose paintings in any shabby chic, romantic cottage, Farm House or French Country home. Measurements are about 16" by 11" for the frame. It is 12 1/2" by 8 for the painting itself. It weighs about 1 pound. GORGEOUS Old 1898 PANSIES Floral OIL PAINTING on Canvas Pretty Colors! THIS IS A GORGEOUS OLD ANTIQUE FLORAL OIL PAINTING OF GORGEOUS PANSIES THAT IS PAINTED ON CANVAS AND DATED 1898. This is an older oil painting that is painted on canvas that is nailed to a wood stretcher frame. It has beautiful pansies that look so real. It is well painted and the colors are stunning. There are scratches, paint loss, repairs and wear. It is signed what looks like C.K.P and dated 1898. This would be stunning alone or on a wall of old floral paintings in any shabby chic, romantic cottage, Farm House or French Country home. Measurements are about 16" by 12". It weighs about 2 pounds. THIS IS A FABULOUS OLD ANTIQUE OIL PAINTING OF TWO PRECIOUS KITTENS OR CATS . 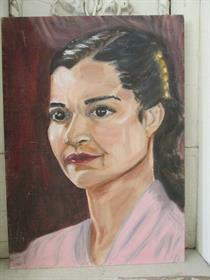 This is an oil painting that is older, of good quality and painted on academy board. It is well painted and the precious little kittens are just adorable! There are 2 oh so cute kitties on the branches of the tree! Look at their adorable faces! The colors are wonderful to fit in any decor. There is a little paint loss and minor wear. The board wasn't cut perfectly even. You can see along the edges where it was removed from a frame. It is so hard to find the old oil paintings of kittens. No signatures or dates. Measurements are about 16" by 10 1/4". THIS IS A GORGEOUS OLD VINTAGE PORTRAIT OIL PAINTING OF A BEAUTIFUL WOMAN. This is well painted that is painted on canvas board. The woman has a beautiful face. She has dark brown hair and brown eyes. She is looking to the side and is wearing a pink top.. There is a little paint loss, some minor scratches, and minor wear. This would be stunning in any shabby chic, mid century, romantic cottage or French Country home. Measurements are about 10" by 14". THIS IS A GORGEOUS OIL PAINTING OF WHITE FLOWERS. This is an older painting that is painted on a round metal or tin piece. This is well painted and the colors are beautiful. The gorgeous flowers are white with green leaves. There is some paint loss, chippy paint, paint crackling, spots and wear, as I show. There are a few minor dings and hairline cracks along the edges. This would be stunning alone or on a wall of old flower paintings in any shabby chic, romantic cottage or French Country home. Measurements are about 14".